Note: this post has a very important update at the end that changes the entire post. Don’t miss that. About a month ago I had the pleasure of (extremely briefly) meeting one of my childhood heroes. That’s me and him there. Note the subtle peace sign he’s managing in spite of the angle of his hand. 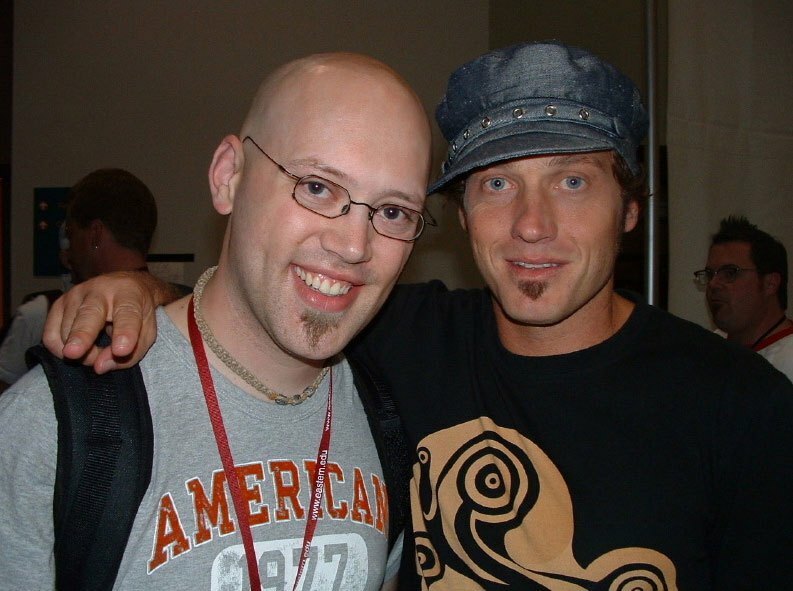 For those of you who don’t know, that’s TobyMac. He is (was?) one third of dc Talk and in the last few years has branched out on his own, seemingly due to artistic differences, blah blah blah. I loved this guy because he was stylish, ultra-hip (especially with that fanny pack… not!) and a Christian. Plus, he gave me an alternative to the nasty rap I listened to in the late 80s and early 90s (Digital Underground, anyone?) because Toby’s lyrics actually encouraged me to respect women instead of using them like tools to accomplish an end. So he’s got that goin’ for him. So now he releases a new album called Welcome to Diverse City, and after hearing the album I’m starting to think about Toby’s racial issues a bit more. Toby has been fighting racism with his music for at least 15 years, but part of me wonders if he’s actually taking it a little too far with his image, and pulling some kind of “reverse Michael Jackson” thing. After having a conversation with Camille, this stuff started to churn in my mind. It seems like Toby almost thinks he’s black, or wants to push his “blackness” to the forefront of everyone’s minds. Am I a bad person if I don’t have a bunch of black friends? I guess I don’t buy the argument that if you’re not friends with someone you don’t love them. Friendship and love are incredibly different things. I’m not saying Toby is definitely making that argument, but it feels like it on first listen. As I was thinking about this, I recalled that in one of dc Talk’s early videos (for a song called “Walls”) Toby raps, “So whether black sheep, white sheep, or even swirl / God watches over all the sheep of the world.” On “black sheep” Toby points to Michael, on “white sheep” he points to Kevin, and on “swirl” he points to himself. I’m not kidding; go watch the video. It’s about 2:53 in. Am I insane? Obviously if you just happen to hang with a crowd that is racially different from yourself, that’s no big deal, but doesn’t it seem equally racist to purposefully seek out other races simply because of their race? Isn’t that proposal attempting to solve a racist problem with a racist solution? I’m so glad you got the fanny pack in there. I was going to have to do it for you if you neglected it. I’ve never really appreciated Toby’s quasi-black status. The word poser comes to mind. My youth pastor, who spent a number of years in youth ministry with actual black students, has a deep dislike for Toby based on this very issue. Why is it so strange to think that this man might be “swirl?” You’re saying that since he’s a white man who seeks to be more “black,” he’s a “poser” or something – do you realize you are judging his actions by the color of his skin (or possibly color of the skin he wishes he lived in)? This is a racist reaction. Let people be people. If they look white and say they’re black, love them. If they look black and exude “whiteness,” love them. If they first look black, then gradually turn white while making platinum albums, don’t let your children anywhere near them. Yes. Totally. There will always be racism as long as we make this big issue of it. Intentionality strengthens racism. If we are the same, there should be no need to make anything of it. It’s like the Seinfeld where George is driven to have a black friend and makes a fool of himself. Wow..TobyMac. Pretty spiffy! Um, I don’t think he’s trying to be “black” or whatever. I just think he wants the world to be more accepting of other cultures, other religions. Since he’s Christian Music Icon, and one that I particularly enjoy a lot, I’ve always given him the benefit of the doubt. I’ve had similar thoughts as you, but I’ve never really been able to hash them out into a cohesive theory of where he stands or what he’s trying to accomplish with race issues. I personally wonder what combination of his growing up in “the burbs of the chocolate city, Luther Jackson was my middle, Pine Ridge my elementary, School of hip hop 1979, And Sugar Hill had the skills that taught me to rhyme”-type environment had more effect on his stance than being in a prominent inter-racial music group that (if I remember correctly from the Free At Last DVD) caused a substantial amount of issues for them (see Colored People, etc.). I’d guess that fighting “associative racism” for years and growing up in an area where he’s the minority (yet, still sees racism first hand in the environment around him) makes him feel that this is a necessary fight for him and that he’s fighting for the people he can most easily associate with. I apologize if this doesn’t make any sense. Makes perfect sense to me! Thanks for your insights, John! It’s true that he could have (and possibly actually did) grow up in an area that would make him an honest-to-goodness member of that culture from his youth. This then brings up the even stranger issue of how one define’s a “poser.” Is it really illegitimate to desire to be a part of a culture that you didn’t grow up with? Is it bad to try to become a member of a culture that you discovered after you had already been alive for X number of years? If so, why? Aren’t we all a little poser? I just wanted to come back onto this thread, years later, and say that I now agree with David’s comment above. Saying that a person has to act a certain way in accordance with their skin color is definitely racist because it takes their race into account when deciding what they should be and how they should act. That’s wrong, and I recant. I just came here to say, I’ve heard/seen Love is in the House a couple times live, and each time he left out the “daddy always said that I wish I was black” line, replacing it with another “a matter of fact” line. So maybe he realized it wasn’t a great choice of words there. 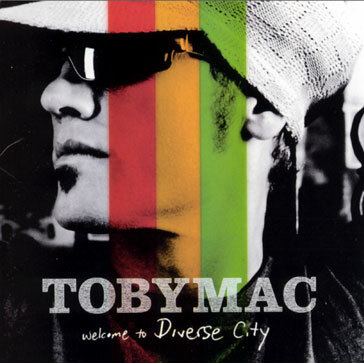 Just to clear things up here, the three colors on tobyMac’s “Welcome to Diverse City” album are the Rasta colors originating from Jamaica. Toby’s wife, Amanda, is from Jamaica and Toby loves the Jamaican culture (note the reggae influence in tons of his songs…especially “Break Open the Sky” on his latest album “Tonight”. He said himself in a LiveStream once that he wanted that song to be recorded like Bob Marley might’ve recorded songs.) If he does wish he was black, then there is nothing wrong with that! Like someone said in this discussion already, saying that someone must act according to their skin color is racist. I personally appreciate the fact that Toby is attacking racism head on…after all, he spent a huge percentage of his life with Mike Tait. I would feel the same when I saw racism after having a black friend.